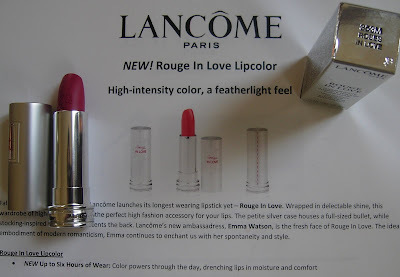 Annie has been curious about Lancôme’s spring products for a while, so she when she shared her invitation to Lancôme’s launch of its new Rouge in Love (lipsticks) and Vernis in Love (nail polish) lines, we were happy to attend the party and report back to her. 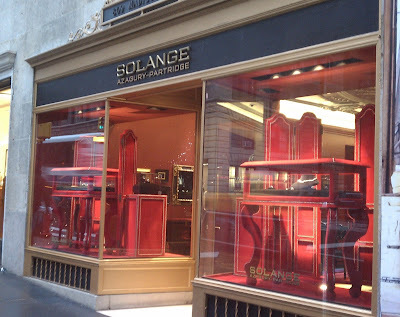 Lancôme held its event at the jewelry boutique of cult designer Solange Azagury-Partridge on Madison Avenue in Manhattan. The shop is a gorgeous little space, like a combination of Aladdin’s cave and a private nightclub from the 1970s. It has red walls studded with tiny crystals, a rainbow-patterned carpet, and shadowboxes and vitrines displaying colorful, unusual pieces of jewelry. Showstoppers include the Zodiac inspired ring collection; Angie had her eye on an white enamel Aries ram’s head ring. Jessica couldn’t take her eyes off a glamour-Goth ring of tiny white-gold “bones” surrounding a shimmery, diamond encrusted skull. Between admiring the gems, sipping complimentary champagne, and nibbling caviar hors d’oeuvres, we were offered lipstick applications by Lancôme makeup artists who chose colors for us. 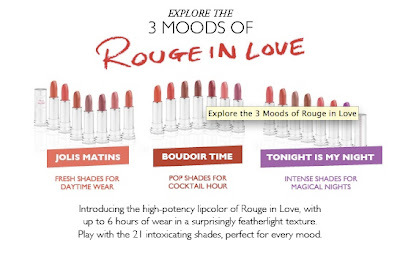 Lancôme has divided the colors into three categories: Jolis Matins (M) for classic daytime wear, Boudoir Time (B) for trendier looks, and Tonight is My Night (N) for glamorous evenings out. Angie was dressed up in Rouge Valentine, a classic blue-red pin-up shade (185N). She was also intrigued by Cocoa Couture (292N, pictured), a deep, chocolate wine shade that would have suited Theda Bara, and Midnight Rose (377N, pictured), a vibrant fuschia that will look gorgeous for spring and summer. Meanwhile, Jessica was matched with Roses in Love (353M, pictured). Its muted-bright medium pink brings a fresh glow to the face, so she’ll be wearing it well into 2012! Rouge in Love’s colors appear matte in the tube, but they apply with a silky finish and a slight sheen. 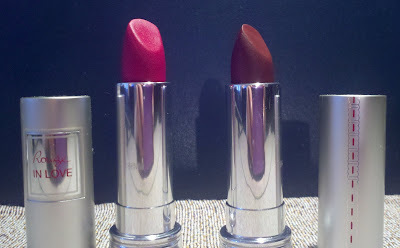 Their texture feels like a lip balm and the color has terrific, even coverage. The packaging is a little bit contemporary and a little bit retro: the matte silver cap has a line of red “stitching” running down the back, like the seam of a stocking! Lancôme also gifted its guests with free Vernis in Love manicures at this party. Angie gravitated towards Vernis in Love in Rose Thé (350M) a muted, brownish pink, while Jessica fell for Rose Plumetis (300M, pictured), a cool-toned rosebud pink with a creme finish. Angie also admired Madame Tulipe (179M), a deep reddish wine, and many women at the event adored Rose Pitimini (343B), a vibrant cotton candy pink. The polishes apply smoothly and easily, thanks to a specially grooved and tapered brush, and two coats give full coverage that lasts for days. Overall, the Solange boutique was the perfect setting for trying Lancôme’s romantic, lushly colored new lipsticks and polishes. Have you seen Rouge in Love or Vernis in Love in person yet? 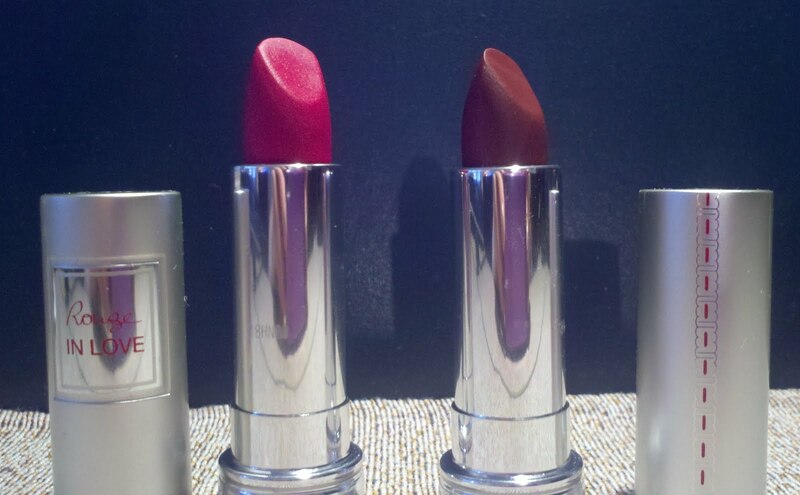 Have you found any favorite shades for this spring? Feel free to share in the comments! Lancôme Rouge in Love ($25) is available at the Lancôme website and Lancôme counters. 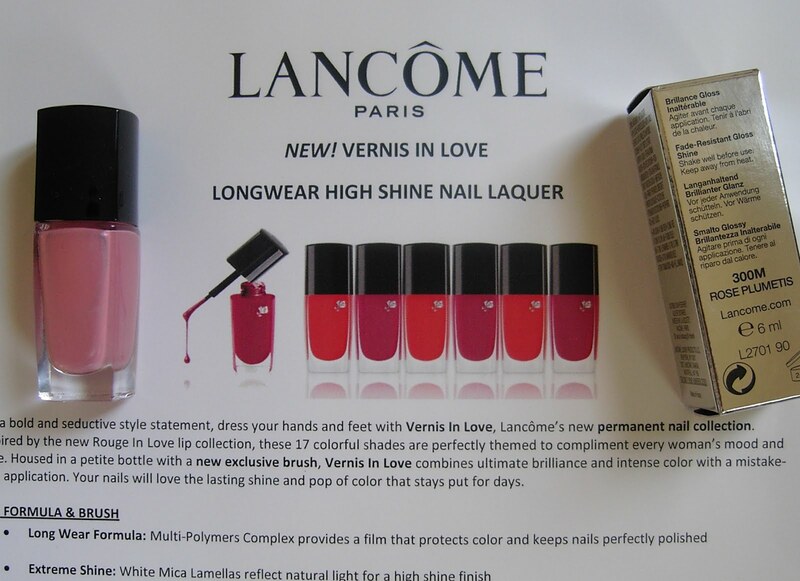 Vernis in Rouge ($15) is currently exclusive to Nordstrom and the Lancôme website; it will reach all Lancôme counters in May 2012. Title: lyrics from “Falling in Love Again,” performed by Marlene Dietrich. Photographs by Jessica M and Angie W for Blogdorf Goodman; ads courtesy of Lancôme.